As if Isla Vistans need any other excuse to spend a Saturday afternoon basking in the sun, the Earth Day Festival drew out crowds from 1 to 7 p.m. for food, live music, and environmental education activities. Celebrating Earth Day a week after a larger festival held in downtown Santa Barbara, the event was hosted by the University of California, Santa Barbara’s very own Environmental Affairs Board. EAB Co-Chair Jeremy Levine tabled for the organization at the event. “We’re a great way to dip your toes into environmental affairs and issues on campus, if you haven’t gotten involved before,” he said. The EAB has been putting on the Earth Day Festival in Isla Vista for a few years now, in a great tradition of getting community members more connected to their beautiful surroundings. There was plenty of tie-dye and tribal print in the crowd as the event kicked off in Anisq’oyo Park. Student artwork was displayed an in open air “gallery.” Guayaki, the makers of the popular caffeinated Yerba Mate drink, gave out free beverages and held a petition to encourage more local restaurants to practice pre-consumer composting. Restaurants like HiWi Tropical Fusion and the Isla Vista Co-op are already participating in environmentally-conscious packaging. The Department of Public Worms, an Associated Students group that has attracted interest around campus for years with its quirky name, was at the Festival teaching people how to make composting cool. A “worm wrangler” explained how their program works with on-campus dining services to take food that is left behind uneaten and with a little help from their slimy friends, create organic matter that reduces food waste. “We can’t give out worms, because they’re technically considered livestock and you actually wouldn’t believe how expensive they are,” said Marli Heininger, a member of the Department. Some basic at-home composting units start at around $30, she says. The group hopes these units will soon be found in houses throughout Isla Vista. Among the more than clubs and organizations represented were the Associated Students Food Bank, CALPIRG, a UC-wide environmental outreach and advocacy program, and Seeds, a student-run ecology and birdwatching club. “Nobody really knows there’s a birdwatching club on campus, so you should definitely bring your friends,” said Carina Motta, a second year environmental studies major who was tabling for the club. The Isla Vista Food Cooperative also offered coupons, samples of organic laundry products and helpful budgeting and healthy cooking tips, all extremely useful for the average UCSB student living off campus. Nicole Griffin, a second year biology student, had fun learning more about the Zero Waste Committee and even has her own set of reusable bamboo utensils. Plenty of activities and free items were set up around the park. The EAB hosted a succulent “adoption” and decoration booth, where anyone could pick their plant and paint their pot under the shade. If you wanted to get your hands on some free snacks, the Co-Op handed out coconut water and donated bulk ingredients for a unique make-your-own trail mix booth, including dried goji berries, tasty wasabi peas, candied ginger, and organic granola. Anisq’oyo Park remained a bumbling center of activity throughout the afternoon with an assortment of live music showcased on the park stage. The lineup included local bands Hedgehog in the Fog, The Walters, Clean Spill, This is Napoleon? and The Six Sevens. San Luis Obispo natives Box The Oxford invited the audience to abandon the shade of their tents and dance in the grass. The I.V. 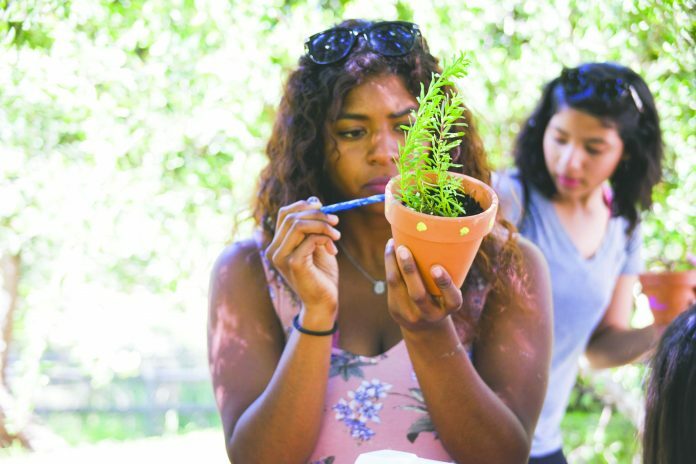 Earth Day Festival served as a way for UCSB students as well as Isla Vista residents to get involved in environmentally minded on-campus activities, as well as learn more about caring for the planet they inhabit. As displayed on a large mural at the event, there is no Planet B.
Jeremy Levine is a copy editor for The Bottom Line.